In an innocuous office complex, three blocks south of Northwestern University, and a short walk from Lake Michigan, you can find the Yellowbrick psychiatric treatment center. Though Yellowbrick treats the expected spectrum of mental disorders, from anxiety to schizophrenia, its mission is unique: it’s the country’s only psychiatric center dedicated exclusively to emerging adults — young people in the ever-expanding gap between adolescence and the stability of family, a mortgage, and a settled career. Unfortunately for you, my dear student reader, business at Yellowbrick is booming. In a recent New York Times Magazine article, journalist Robin Marantz Henig provides a haunting portrait of a typical Yellowbrick patient: he’s a young man “who had done well at a top Ivy League college until the last class of the last semester of his last year, when he finished his final paper and could not bring himself to turn it in.” This brief moment of existential despair spiraled out of control. In other words, when you go through life thinking “if I can make it through this, things will be better later,” you eventually forget what “better” means. This doesn’t mean that every student who sees school as a trial to survive will end up at Yellowbrick, but the despair that accompanies the perpetual postponement of an enjoyable life has a way of making its presence known. 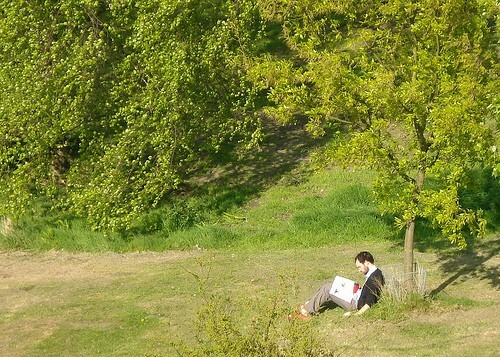 It is seen, for example, in the regular e-mails I receive from college students suffering from deep procrastination — an advanced stage of burnout where, as with the Yellowbrick patient mentioned above, completing work becomes impossible — or the quiet desperation of the overworked law associate who strains to remember why, exactly, law school had once evinced such certainty. I didn’t write this letter to chastise. In fact, I’m dismayed by the growing number of (often Ivy League educated) voices in the student stress debate who cry out “there’s more to life than Harvard!”, but provide little guidance to what such a life should entail. I write instead to suggest an alternative. I spent the last decade researching and writing books about students who defied the survival mindset. These are students who did well academically — they got into good colleges, and went on to interesting jobs — but did so while enjoying their lives. These students revel in an open schedule and the ability to dedicate more than enough time to a reasonable course load and a small number of activities. They recognize the deep satisfaction in an unhurried afternoon spent grappling with an AP Literature assignment under a shade tree. Along with the time affluence granted by doing less comes an obligation to do the small number things they do much better. These students recognize that they’ll ultimately be judged not by the sum of their contributions to diverse activities, but instead by the magnitude of their ability in the one thing they do best. For them, however, it’s about more than the aura of stardom that shines from someone with true ability, there’s another deep satisfaction to be found in the craftsmanship of slowly building skill, a thin layer at a time. These students practice the above rules not as a means but as an end: A life with both freedom and focus is a life well-lived. In the short term, this approach will help you get into a good college and then excel once there, but its effectiveness lasts well beyond. 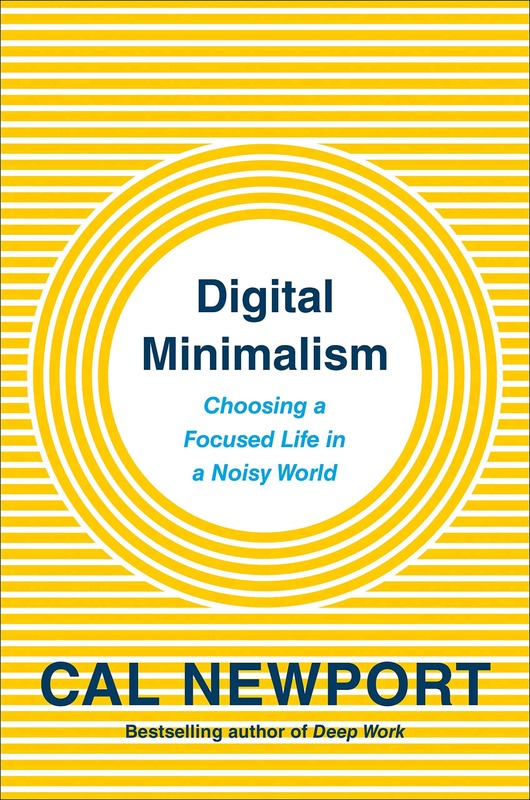 Consider, for a moment, someone whose life you admire as being capital-G Good — perhaps, for example, a respected writer or profound thinker — you’ll likely note that they, like these students, dedicate their time to a small number of pursuits (perhaps just one), but do those small number of things exceptionally well. Three simple rules; six short words: it’s a compact philosophy, but its impact is great. 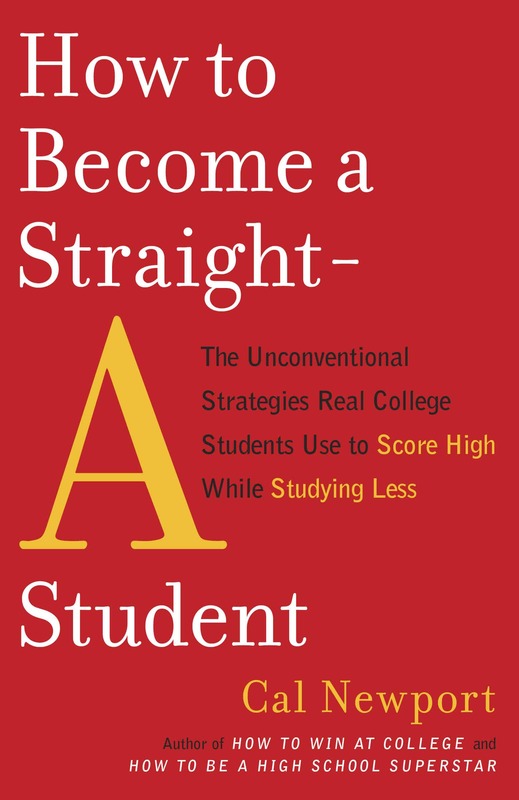 It explains how Michael got accepted to Stanford with a weekday routine that included a two hour, head-clearing hike, and how Sarah got into Princeton with a schedule that allowed her to finish her schoolwork before dinner. It also explains how Alice, who had to withdraw from college for a semester due to poor performance, ended up becoming an A student an honored as one of the top tutors on campus after drastically reducing her course schedule, and how Scott became a stand out at his law school after eschewing the activities new students were expect to take on. People express strong feelings about their expectations for the modern academic experience, and to many you might encounter, the idea of doing less will prove simply inconceivable, and perhaps even offensive. But as you start your fall semester, keep Emerson’s wisdom close, and remember that these strong feelings have no deep support and are likely of little real consequence. Put another way, forget that overworked junior, stage-managed by his $900-an-hour college counselor, and ignore that triple-major who proudly broadcasts his growing tally of all-nighters: it’s your life and your right to invest abundant mental energy in figuring out how to live it well. Hopefully the ideas presented here will give you a good place to start. I read the article that you referred to in this post a few days ago and it left me feeling well…a little depressed about the state of my generation. However, this post has served to remind me that there is another side to this story. There are young adults who are doing interesting, enjoyable, and meaningful things with their lives. And it seems to me that the best way to insure that I will be in this group of young adults, who are capable of maturing and crafting a meaningful existence, is that I must start now and not after graduation or some other undefined time in the future. Because right now is the perfect time to start laying the groundwork for the sort of life that I want to live and the type of philosophy that I want to govern that life. 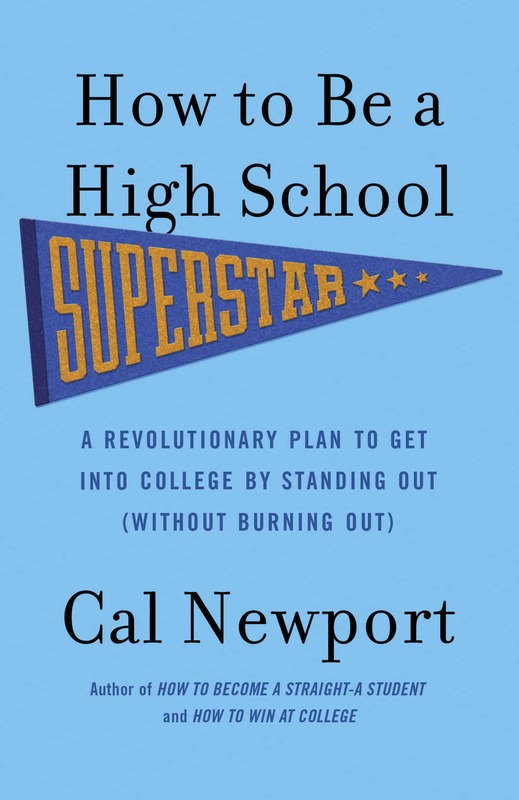 Cal, as a college teacher and the parent of a college sophomore, I applaud not only this post but the work you do to help young adults–especially bright young adults who often feel conflicted about what it means to have high potential–to think about their education, learning, and life differently from the status quo. I will share this post with my own college classes this fall. “A life with both freedom and focus is a life well-lived.” – Spot on! Some people need a great deal of structure in their lives. And, in a structured environment they may perform quite well. Once school is over the structured environment tends to disappear. These students are now cast adrift; the unknown & unfamiliar is scary. Many are not the explorer type. Yes! Cal finally addressing us college graduates … look forward to future posts on this. I see too many people after college still living this out. Thanks for the guidance – short and sweet and totally doable. Passing it along to others – thanks. Wished I had read it a few years ago. Yes, Cal, I wish that my parents and I had read these words before I’d gone off to college 23yrs ago. I completed a college major that I hated (chemistry) just to improve my chances of getting into medical school. I spent four years and $80,000+ spent in a manner that I will not approve for my two kids. I’d rather that they go into a field of study that they really love and get to their ultimate goals in a manner that is truly enriching inside. I might not be a successful physician right now if I had taken a different pathway but I live with the regrets of never having taken some real risks that could have paid off. Too bad for me. Very good for my kids. Pingback: Mind-Manual » "I’ve got a year left, I hate my degree but I’m just going to finish it." In the survival mindset the goal becomes to just get through your degree with as little pain as possible and every assignment comes to be seen as an annoying obstacle, rather than a chance to learn and develop. I went to a syllabus workshop for graduate students a couple weeks ago, and a statistician mentioned your book. He could not remember your name, so I told everyone your name and referred them to the Study Hacks Web site. He is thinking about requiring your book in his math classes, for undergrads. And it seems to me that the best way to insure that I will be in this group of young adults, who are capable of maturing and crafting a meaningful existence, is that I must start now and not after graduation or some other undefined time in the future. I’m always surprised by the lack of serious discussions on these issues. There’s a crucial distinction I want to make here. I’m not necessarily advising students to “study what they love,” because I don’t believe that we all have these inborn passions (for majors; for professions) etc., that need to be identified. If anything, this mindset can cause further trouble once young people fail to identify these non-existent natural interests. Instead, I reverse this notion and advise: love what you’re studying. Get into the craft of knowledge. Make it part of a sustainable, engaging, enjoyable life. The more people writing about this, the better. Excellent. Keep me posted if he does use the book. Thanks for a wonderful post. As usual it applies just as well to me in my 8.30-6 job. I always take a lunch break in which I cycle home (I live in Munich where city cycling is pleasurable), eat lunch, take a short nap and cycle back. What a total pleasure and I always arrive back at the job feeling refreshed. Thanks for the inspiration to continue with this Cal. Well said Cal,Thanks a lot. I read your book cover to cover. This is something I haven’t done with a book in quite a while. I had my so-called crash about three years ago. In high school, I was a slacker with no superstardom to speak of, but amazingly, I did get into the best schools despite endless hours wasted on Internet addiction and videogaming. This habit of course did not mix too well with 5 classes per semester and they kicked me out. The existential despair has slowly been dissipating over the last few years. I think your book was the final nail in the coffin as I now bury my apathy. I’m not saying I’m a new man, but I certainly have been feeling a lot better in the past month. 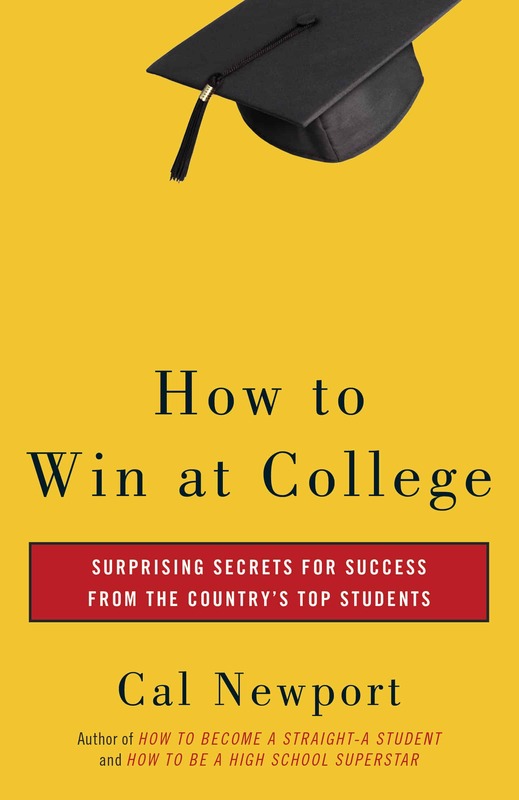 I’m surprised you targeted this book to high schoolers as I’m way past that stage and yet find this book to be a wonderful beginning blueprint for my journey. It’s the first day of school today and I’m already well ahead of my classes. I don’t recall EVER beginning my school studies before the semester officially began, let alone a month prior. There was always a big mental wall that instinctively said, “Don’t”, like a small child avoiding a hot stove after getting burned. But now, I bite off what I can, then I move on to my two activities. I’ve never been this enthusiastic about life in general. It’s a rare feeling when you feel free and productive at the same time, and going to the library knowing you won’t even be there for an hour, just there for a nice review sprint, and then off I go! It feels so revolutionary yet it feels like what I’ve always been doing, only applied to the wrong activities. I’d love to hear more about the Study Hacks philosophy for graduates. I certainly understand that pleasure: I run home along the water in my lunch break; stopping half-way to work out under a shady willow, and often spending the next 10 – 20 minutes working on hard book with hard ideas before continuing home. It feels so revolutionary yet it feels like what I’ve always been doing, only applied to the wrong activities. Nothing makes me happier than hearing about people taking back control of their lives. If you feel moved to do so, consider, perhaps, transforming this comment into a review on Amazon. Students take these reviews seriously when deciding whether a given book is right for them. It is wonderful to visit your site for the first time today. After reading your name on Scott Young’s blog, then meeting a few others who also love this site, to then see you on Zen Habits today felt like coming here was all meant to be. I really enjoyed your post on ZH today! It reminded me of when I applied to college; it being small and very expensive and wondering how I who needed financial aid to attend would get accepted over someone who did not, and who also had good grades and was active in the community. The application wanted you to show a piece of yourself. Without thinking too much about it I baked a cake to bring to the interview simply because I loved baking and decorating cakes. Not only did I stand out and get accepted simply by doing something I did all the time, baking a cake, I also ended up in the Newspaper. Who knew then that just letting your passion flow out from within you, sometimes without much thinking about it could open up some great doors? I love that you are inspiring other young students to do the same. Honestly, I did not find what I was passionate about in school, it was not until life slowed down and I was quietly staying home with my kids. I think something overlooked in this post and the comments is that this type of focus is largely a question of maturity, which develops for different people at different times. In my opinion, it is natural for an aspiring and intelligent young person to do too much in early life. Too many things can be a good thing. Perhaps the goal of a young person is not to get into an ivy school and go on hikes? Perhaps its to explore the breadth of what they’re capable before they settle on what they can be rewarded for? I think more at issue is the loss of social signals to begin the focusing period of young adulthood. Learning to focus on a few things, that is a natural, although difficult part of growing up, and that may happen for people at different times. While I agree with the author of this blog that the forces at play can often go awry, I disagree pretty vehemently with how he has rolled the NYTimes article into his paradigm. It comes across as far too convenient. It seems like everyone has read whatever they wanted into that article, and this blog isn’t the only one. Thanks Cal for this post. For many years I saw school as a “trial to survive” and often hated school and soon I developed deep procrastination habit. I would strongly suggest people not to see schools as their “trial to survive”. Ironically, I got here after writing an email in which I vented my frustration with high school. I am a senior who is working on a 15 course, closed schedule. How could the “do less” alternative apply in my context? “Do better” and “Know why” also fail to apply in my situation. What other alternatives would you suggest? I don’t know what a “15 course closed schedule” means. …meaning 15 individual and inflexible classes/courses per semester (different education system). Hi, Cal. I’m a high school student and a huge fan of your incisive and thorough books. However, I was bedazzled by your ability to observe students’s common worries and analyze them in such reasonable details. I’m eager to learn from your experiences. So, I really hope that you would be generous enough to clear some questions of mine. 1) How do you discover diverse problems faced by students while busily running a popular blog and writing advisory books, since all three if the mentioned activities are time-consuming? 2) What do you think is the best suggestion for over-achievers? It’s been over 4 years since I last visited this open letter. I first read it back when I was a burnt out highschool junior dealing with college admissions. Even today I still find comfort in your philosophy of simplicity. Words aren’t enough to express the gratitude I and many readers have when reading your words. Thanks again!